How to get the Tibet Travel Permit? Tibet is often known as the “Roof of the World”, and is a popular place for travelers to visit to learn more about the unique Tibetan culture, immerse themselves in the divine Tibetan Buddhism, or just go sightseeing around the countless lakes, mountains and monasteries that can be found all over this high-altitude region. Moreover, every year, thousands upon thousands of foreign visitors make the trip along the Qinghai-Tibet Railway, the highest railway in the world, to spend time in Lhasa, Shigatse, holy Mount Kailash, and the ever-popular Mount Everest Base Camp. 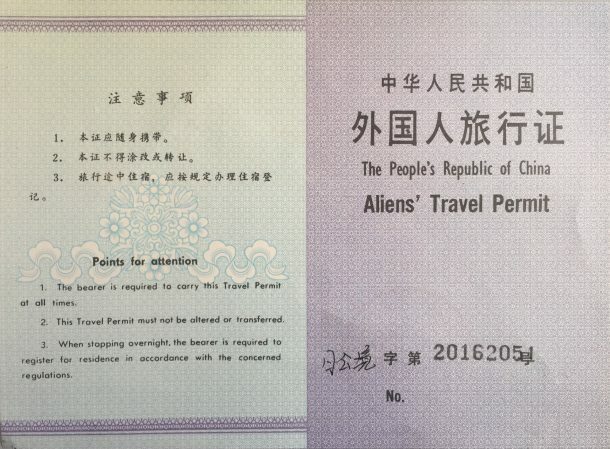 According to the law of the People’s Republic of China, all foreign visitors need certain permits to be allowed to travel around the region. 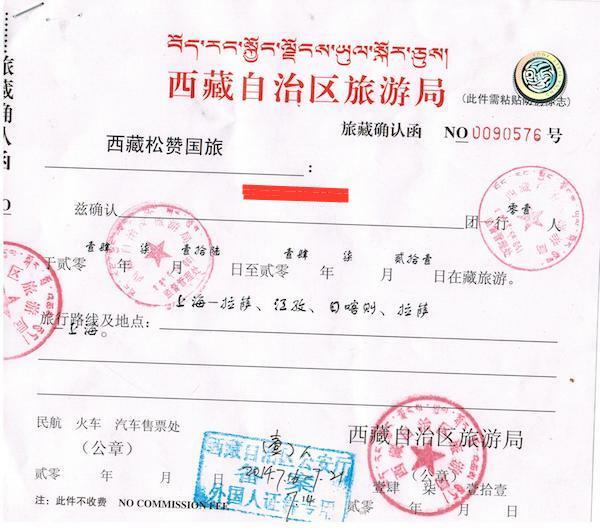 A permit is first needed to get into Tibet, by either train, overland or flight, and other permits are required to travel outside the area of Lhasa itself, such as the Alien’s Travel Permit and the Military Permit. However, there are still some places that are restricted, and no permit will get you into them. There are also two different routes to travel Tibet, from either China or Nepal, and each has a different set of requirements for travel, sometimes even depending on your home country. Apart from a passport, the main thing you need to obtain is your Chinese Entry Visa. This can be obtained from the Visa Office of the Chinese Embassy in your home country. There is currently no way to obtain a visa through an online facility. However, you can fill out the Visa Application Form online and print it prior to taking all the requirements to the embassy. China also has no option of Visa on Arrival, except in certain emergency cases for non-tourists. Contrary to the common belief, the Tibet Travel Permit is a tangible permit, not a stamp in your passport, and there are no plans to change this. The Permit must be obtained through a registered tour operator such as Explore Tibet. Permit applications by individuals are not permitted, and all applications must have a pre-booked itinerary with the tour operator before application. The permit requires a scanned copy of your passport, showing the photo and date of issue, and with 6 months validity left. You also need to provide your tour operator a scanned copy of the Chinese Entry Visa, and a copy of the itinerary. The visa takes only one day to process if you are traveling into Lhasa Gonggar International Airport (except those traveling from Kathmandu), or up to 10 days for those traveling by train along the Qingzang Railway. While the Tibet Travel Permit allows you to visit Tibet, and explore Lhasa and the immediately surrounding area, for those wishing to go further afield to the “unopened” areas of Tibet, an Alien’s Travel Permit is required. Also known as the PSB Permit, it is obtained from the Foreign Affairs Division of the Public Security Bureau in Lhasa and will be arranged by your guide once you are in Lhasa. It is not possible to apply for it in advance. Since it requires your original passport, Chinese Entry Visa, and Tibet Travel Permit for the application. The permit normally takes just a few hours, and only costs around 50 CNY per application. For those wishing to do an overland tour to Tibet from Yunnan, Sichuan, Qinghai, or Xinjiang Provinces, you need to get the PSB Permit before the tour starts. The Military Permit is required for entry into certain sensitive areas of Tibet, such as Ngari, Nyingchi, and Nagqu. It is issued by the Military Office in Lhasa, and is arranged by your guide. Your original passport and Tibet Travel Permit are required for an application, and it takes around 1-2 business days to process. Your guide will normally do this as soon as you reach Lhasa, and it costs 100 CNY per person. The Group Tourist Visa is a kind of single-entry visa that is obtained through the Chinese Embassy in Nepal by your tour operator. Individual applications to the embassy are not permitted. Your tour operator will require a scanned copy of your passport. Previously, the Group Tourist Visa could be obtained for an individual; however, there is now a required minimum of three travelers per group. 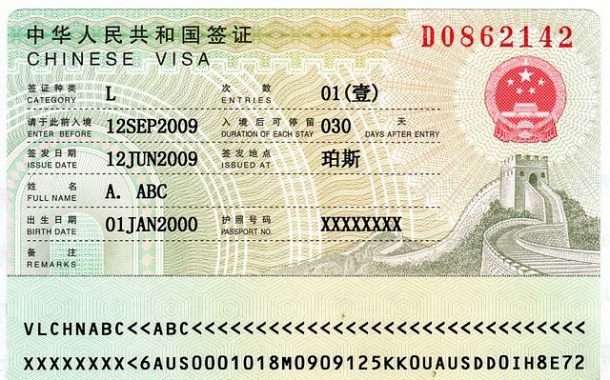 Normally, all the members of a group will be named on the visa, and it is required that all members enter and leave Tibet at the same time and through the same port of exit. There is also a restriction on the number of nationalities in a group, and it is limited to two only. There are also restrictions for the nationals of 26 countries that require them to obtain the Group Tourist Visa from the embassy in their home country. Similar to entry from China, this permit is obtained by your tour operator, along with the Group Tourist Visa using the scanned copy of your passport, once your tour has been booked. For both Permit and Visa from Nepal, you should be in Kathmandu at least four days before your tour into Tibet to process the application. Your Group Tourist Visa and Tibet Travel Permit will be delivered to your hotel in Kathmandu. Tip: It is important not to mention Tibet in your itinerary when applying for the Chinese Entry Visa, as this can cause complications. Travel through China is not restricted to just your itinerary, so changes can be made easily.